Actors Anushka Sharma and Varun Dhawan were today spotted on the sets of Sui Dhaaga, their forthcoming film. Their pictures, dressed in the roles of Mamta and Mauji, respectively, have been shared widely on social media and are now trending. Anushka and Varun are currently filming Sui Dhaaga in Mumbai. In the pictures, Anushka can be seen wearing a pink sari and carries a bag with her while Varun is casually dressed in a shirt and trousers. Sui Dhaaga has been making headlines regularly, for pictures of both the lead stars. Months ago, sneak peeks from the film's sets in Bhopal and Delhi had hit the Internet while Anushka and Varun have also treated us to some of the pictures. 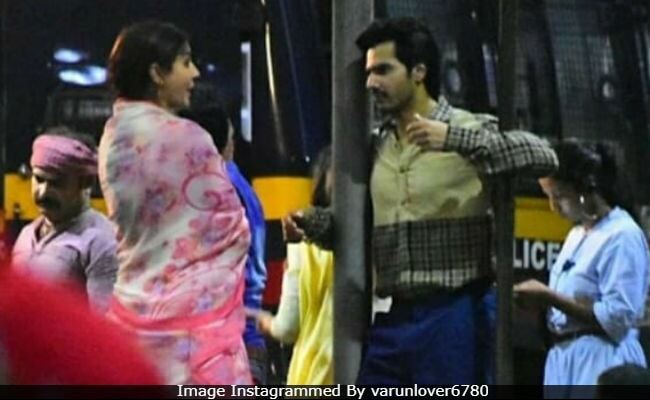 Here are Anushka and Varun's pictures from Sui Dhaaga sets. Just two days ago, Varun shared a video with Anushka, where the duo are seen enjoying a bhutta. And, remember this picture of Varun riding a cycle with Anushka on the pillion? Set in small town India, Sui Dhaaga will see Varun playing a tailor and Anushka an embroiderer. For their roles of Mamta and Mauji, both of them learnt to sew and embroider. Meanwhile, for those who don't know, Varun's Mauji is also 'inspired' by comic character Suppandi. "I love reading Suppandi. I used to read that a lot during my childhood. Even the characters I do, like right now I am playing this character of a tailor Mauji in Sui Dhaaga...there is more to him than just being a tailor as he is a peon in a shop as well. Mauji is very inspired by Suppandi," he told news agency IANS. Sui Dhaaga, directed by Dum Laga Ke Haisha's Sharat Katariya, and produced by Yash Raj Films, hits the theatres on June 28.